Magic cards don’t take much to catch fire, huh? If you’ve been following along online, a bunch of people have been working on a new version of a combo deck called “Cheeri0s.” If not, let’s take a look at why this is one of the hottest new decks in Modern and what the most optimal way to build it is. With few expensive cards and a new angle of attack, it could see a big rise in popularity soon. Results for this deck are just trickling in, and while a lot of Magic content creators have covered the deck in some capacity, tournament results speak so much louder than words. Lists are still evolving and data is short, but to start with I’ve chosen this list by Caleb Durward which went 5-0 in a Modern Competitive League on Magic Online. Let’s start with a history lesson. Why is it even called Cheeri0s to begin with? I’m not exactly sure who coined the name of this deck, but I do know where the origins are from. Way back in the day, when decks had names that didn’t include the colors of the mana and the cards contained within, combo decks had a weird naming scheme. Trix and Fruity Pebbles are two of the earliest decks that adopted the breakfast cereal naming scheme. Later, the much better iteration of Fruity Pebbles was called Cocoa Pebbles to loosely connect it to the original combo (plus it added black). Later combo decks adopted more loosely breakfast-themed deck names including Full English Breakfast, Cephalid Breakfast, and Eggs (a deck you’re probably familiar with if you’ve played Modern for a few years). Cheeri0s is another cereal that emphasizes the zero-casting-cost cards with the zero in the name. That being said, Cheeri0s is a deck that is pretty simple to explain and reasonably easy to play. The play patterns stay pretty similar and it’s fairly resilient to most hate cards. The most effective and popular hate cards like Chalice of the Void, Leyline of Sanctity, and Stony Silence are significant roadblocks, but they’re beatable. This is a deck that can be probably taught to any player relatively easily so I would definitely recommend it to someone who wants to start playing Modern, as well as a player that is more well established. Cheeri0s is the kind of deck that could get too good and get something banned, which is bleak for its future. While on paper it looks like it’s pretty easy to interact with a bunch of two-mana 2/2s, it doesn’t always boil down that way. Mox Opal is the most expensive card in the deck and also the most likely to get banned. To be clear, I don’t know if it will get banned, but it’s definitely on my radar as the type of card that they could go after. If Cheeri0s takes off, it will be the third Mox Opal deck sitting around the top tables (along with Affinity and Lantern Control). That being said, Opal is also the card most likely to be reprinted in a Modern Masters set at some point. With that in mind, there is unlikely to be much help for this deck coming in the near future. Sram was an unpredictable but welcome addition to the deck but it’s hard to see what kind of cards might improve it without pushing it into ban territory. 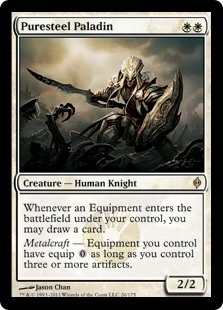 Unless there is a new zero-mana equipment that has an unreasonable equip cost that can be subverted by Puresteel Paladin, we are unlikely to see any more cards that fundamentally change the deck like Sram has. The core of a deck are those cards you absolutely need to play, where substitutions are likely impossible. Copies of these cards are included almost universally across decklists. This deck is a little different than average because while zero-cost equipment is part of the core, the particular ones you use doesn’t matter that much. Cheeri0s is comprised largely of the some unplayable zero-mana equipment, Mox Opal, and a bunch of low-print-run rares. Due to the fact that this is a combo deck you really can’t play an “unfinished” version because there are just no substitutes for the key cards. At a bare minimum you must purchase Sram, Senior Edificer, Puresteel Paladin, Retract, and Mox Opal. Due to the popularity of the deck right now I don’t want to quote exact prices because they’re likely to be incorrect by the time you read this, but as of right now these total approximately $335. If you are interested in this deck and thinking about buying in, I would recommend doing so as soon as you can because as SCG Regionals decklists are revealed it may cause price fluctuations. While the core of the deck is more than the four cards I listed above, the rest of the core is pretty interchangeable. Zero-mana equipment make up about a third of the deck and the only one with a functional need is Paradise Mantle. This one is frequently used to provide red mana for the kill condition (Grapeshot) and your deck will suffer from not playing it. Most of the rest of the equipment are pretty cheap and mostly don’t matter. I would recommend, since it’s cheap to do so, to keep the ones Caleb is playing as the toughness-increasing equipment helps much more than the power-increasing equipment. That’s why the deck is maxed out on Accorder’s Shields, Cathar’s Shields, and Spidersilk Nets before Kite Shield and Bone Saw. The last equipment that Caleb plays is Sigil of Distinction, which is theoretically much better than a Bone Saw when you’re on the embarrassing creatures beatdown plan. That being said, I haven’t seen many lists playing it and I don’t think you lose too many percentage points playing more Kite Shields or whatever your equipment du jour is. At a minimum, you want to purchase the cards listed as the core above before going forward. The mana base in this deck is overly expensive on paper because most players are using the most diverse fetchlands instead of just 4 Flooded Strand and 4 Windswept Heath. The reality is outside of some bluffing tactics it really doesn’t matter which ones you play as long as they can fetch Plains. Horizon Canopy is also an optional land which you won’t need often and it can just be a basic Plains for budget reasons. I mentioned above that the deck really doesn’t function without the core 16 cards in the deck. I would recommend getting Puresteel Paladin and Retract first because they have the least likely chance of being reprinted in Modern Masters 2017 and are irreplaceable for this deck. Next I would work on the Mox Opals because they are played in multiple decks and command the highest price tag, but also because Sram is in the newest Standard set and is likely to see decreases. After that, I would recommend buying Swan Song, Paradise Mantle, and Noxious Revival. While they’re not particularly expensive right now and probably won’t increase a lot in the near future, they’re the kind of card that people don’t carry on them. So they’re hard to trade for and stores with low or inconsistent stock may not have them. If the deck catches on in your area your only option may to purchase them online and getting them sooner rather than later makes sure you aren’t missing them the day of the tournament. Compared to a card like Serum Visions, which everyone uses and knows is popular in Modern, you could run into trouble finding a store that has more than one Noxious Revival. After you’ve got some of the weird, albeit important, cards for the deck, you should work on the o’s part of Cheeri0s and grab the rest of the zero-mana equipment. You can’t play the deck without them so the only benefit of waiting this long is to make sure you’re not wasting your $5 before you can actually play the deck. There is no significant strategic advantage to buying them earlier or later because this is the only type of deck that might want them and they’re all pretty easy-to-find commons (with the exception of the earlier mentioned Paradise Mantle). The last few cards are things you might already own if you play Modern but should be relatively easy to find in stores and you can buy last. Serum Visions and Grapeshot are the last two important ones before getting to the lands. Of the sideboard cards, I would recommend getting the Leyline of Sanctity and Echoing Truth as those are fairly irreplaceable effects. The rest of the cards I assume can be changed to some degree. Silence is played instead of counter spells because you’re unlikely to really be able to win a counter war and a single Silence can stop interaction spells for the whole turn. The last thing I recommend is getting at least the Hallowed Fountains and white fetchlands for this deck. They’re pretty important for the consistency of the mana but also you don’t want to draw too many actual lands because it makes it harder to chain Retracts. The manabase is definitely the biggest compromise you can make while building the deck. Seachrome Coast is a filler land and could just be more Hallowed Fountains. The 2-2-2-2 split on fetches is technically most correct but in reality doesn’t matter that much. The Horizon Canopy is the land that adds the most to the deck but is also the least likely to be drawn. The reality of the deck is there just really aren’t any budget options for a lot of the more expensive cards because the value of them is so concentrated and the effects are so irreplaceable. The first thing to think about is what kind of sideboard you need for the tournaments you’re planning to play in. 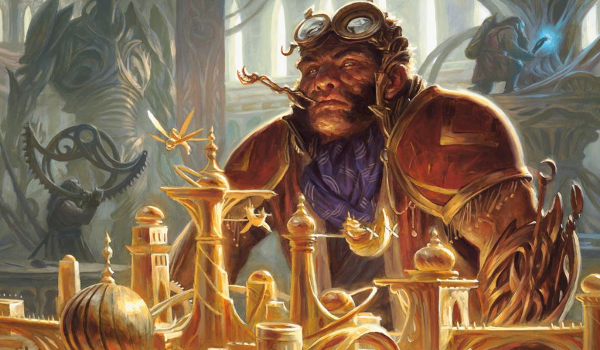 Most people don’t travel for Star City Games Opens or Grand Prix, so a lot of what your sideboard looks like usually will be dependent on the popular decks in your area. With this deck however, there are not a ton of cards that you care about that your opponents can play. It’s a straight-forward combo deck like Ad Nauseam and Dredge, where your sideboard is a bunch of reactive cards targeted against hate cards rather than against opposing threats. Caleb’s sideboard choices are, I think, currently as close to perfect as they can be. Echoing Truth is good against permanents that stop you from comboing (including but not limited to Stony Silence, Chalice of the Void, Leyline of Sanctity, etc.). Silence is best against decks trying to interact with you (usually via counter spells) on your turn. Leyline of Sanctity is best against decks trying to beat you with discard and pressure but it also protects you from other combo decks to some degree. The Path to Exiles I assume are for faster decks where Echoing Truth is unnecessary and too slow (like Death’s Shadow, Primeval Titan, Griselbrand, etc.). I’m not exactly sure what the extra Grapeshot is for, but my assumption is that this can be a flex slot. For this week, I’ll start by mentioning what isn’t moving, which is Fatal Push. It’s still hard to find under $4 and I think a little bit of that is player’s reluctance to sell it. It’s a fine card for sure, but in this day and age it’s too hard for uncommons to stay over $1 for very long. If you’re patiently waiting to purchase some, I continue to recommend that. As for the biggest gainers this week, most of them are part of this deck. Retract, Mox Opal, and Puresteel Paladin are at all-time highs due to the popularity of the deck. I bought 10 copies of Retract for about $2.50 with the thought that the deck would get popular and it certainly has. I don’t have them anymore, as I sold them during their first spike, but I think this low-print-run rare can still grow some more if Cheeri0s starts winning big tournaments. Unrelated to Cheeri0s (or maybe related tangentially) is a recent increase in the cost of Runed Halo. It’s hard to pinpoint why this card would change because its age and sole printing mean it’s in extremely short supply. It’s a niche card that probably won’t be in Modern Masters 2017, but not much has changed to warrant a price increase. It’s possible that it is an inclusion in some Esper decks as a way to hose Valakut and similar combos, but I don’t know what to tell you. It’s odd and if I had any copies I would sell them. With Pro Tour Aether Revolt and SCG Regionals in the books, I am excited to see what happens in Standard and Modern. Last week’s SCG Modern Classic was won by a Goryo’s Vengeance deck, which is both confusing and unsurprising at the same time. The Top 16 decks are really all over the place so I’m not sure if it’s the product of a new metagame or just a weird circumstance in that area. We will get some of the largest data dumps as the SCG Regionals decklists start coming in, and get a clearer picture of how the bans have influenced the creeping Modern metagame. While I hate the constant ban fears that have come to be the norm for Modern now, if something were to be banned my money would actually be on Retract over Opal. Banning Opal is a pretty serious hit to Affinity: a deck that’s been in the format forever and has never been overly oppressive. Retract is the card that really opens things up. While it’s true you can run Hurkyl’s Recall in its place, the difference in mana cost makes it far more likely to fizzle since you can’t just go off on a single Opal. 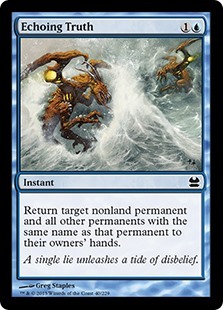 Additionally, Recall is a Spell Snare target which is becoming more common in the format. The deck hasn’t exploded yet in paper to suggest a ban will be coming. Then again, it took a while for dredge to take off beyond mtgo as well. It does seem like a deck where, should that “missing piece” get printed, something we weren’t expecting that adds some level of redundancy or resilience the deck didn’t have before, it would draw the ire of the Modern police. I most certainly agree with you. Retract is the big offender here, not Mox Opal. Retract looks worse here, certainly, but Mox Opal is a problem that displays many symptoms. Much like Gitaxian Probe. Infect or Become Immense aren’t as big of problems when you remove the safety and traction you gain with Gitaxian Probe. I’m not suggesting that Mox Opal would be banned because of this deck specifically but like Gitaxian Probe (which was recently banned) it is played in many decks that tend to skirt what is acceptable speed for Modern. Banning would only serve to remove the symptom but not solve the problem. Mox Opal is arguably better than Chrome Mox which remains on the ban list and I could see a time where it’s finally time to put the nail into that coffin. frankly, I find it hilarious that we’re already talking about bans on a deck that has put up zero results and folds to any amount of interaction. I thought modernnexus was supposed to steer clear of ban mania? I have said previous to this that Mox Opal skirts the line of what is acceptable in Modern. It is very expensive to buy and extremely powerful. I believe if I did not bring to light the risk of it getting banned then I would be doing a disservice to people who are expecting to get the best financial advice from my articles. makes sense. I just wanted to dispel any hype-fueled notions people had that cheerios would dominate modern when in reality it still seems unplayable. Halo shows up in a lot of UWx control decks, which are enjoying renewed interest thanks to Fatal Push. I’m pretty sure nobody here has been discussing the potential for bannings with any degree of mania. Modern has some pretty clear rules, and decks that can consistently violate those rules are a natural subject for policing conversation. There’s nothing manic about this, as there has been in the past. fair enough, though I disagree that the deck is consistent, my own goldfishing shows the deck dies to itself at least 25% of the time, and one piece of interaction usually spells doom. the recent results seem to support this, scg regionals had no copies in the top 8 out of any of the tournaments. I know that decks that consistently violate the turn four rule are usually ban worthy, though this deck can’t usually do that through interaction and lacks the aforementioned consistency. In the end, I think this deck is way over hyped and highly encourage anyone considering investing in it to reconsider. if you like this type of strategy, try storm, it’s way more consistent and still fast enough to kill aggro decks. True, but just bear in mind that this is a financial deck tech, as in a way to try to build a modern deck for a player who may have a budget that only allows a few cards to be bought a month. With that said, it makes a lot of sense to note ban-worthy cards, as that risk is part of the investment. Still, Jim I am loving the series. Thank you. It appears we may have done a poor job of explaining risk, and how the MTG finance community generally approaches it. Jim is not saying he believes that the deck will be banned, he’s simply hedging his (potentially costly) bets. In the finance community, after asking what the upside is on an investment (the potential gains), the next question we always ask is about the risk. In other words, the downside. What happens if we’re wrong about some of our beliefs? How much farther can it go down from the buy-in price? What is the likelihood of this happening? Asking these questions means we have to address the question of bans. It doesn’t mean we think the deck WILL get banned, it just means we have to consider the possibility. In the case of something like Jund or Jeskai, these concerns are likely to be of less importance than reprint risk. In the case of a degenerate combo like Cheeri0s, we have to wonder if our investment might be working on borrowed time. Perhaps Jim would be interested in going over the basics of risk management in a later article. For now, hopefully this explains why he brings up the dreaded b-word in the article. That pretty much sums up what I would have said. Bans are a part of a Modern and some cards are more at risk than others. Bans are infrequent but when they do happen they have a huge impact on the financials of cards surrounding the ban as well as the banned card itself. We can look at the most recent ban list which banned Golgari-Grave Troll and caused a spike in the price of Golgari Thug. Trolls weren’t that expensive and the dredge deck exists so the net loss for someone building the deck is pretty low. If Mox Opal gets banned it could drop to $20 or less. That’s a pretty significant amount compared to the $40 or so for a playset of Golgari Grave Trolls.